DIRECTIONS: This cemetery is on County Route 51 (the Creighton Road), .2 miles south of the intersection with Route 37. This cemetery was first recorded by the McLellan family in May 1953 and July 1954. Thanks to Wayne Miller, Librarian at Special Collections, SUNY Plattsburgh, Plattsburgh, New York for access to McLellan's Cemetery Collection. It was later transcribed by Virginia A. Wolfe on June 14, 1984 and Jean L. McGibbon Goddard with her daughter Susan McGibbon Tobias on August 26, 1997. Thanks also to Jean & Susan for allowing the use of their work. This transcription was typed from McLellan's work and then compared to the two later transcriptions. Discrepancies were resolved in the following manner: 1) If at least two of the three transcriptions matched, the data was assumed to be correct. 2) If all three transcriptions differed, I checked the stone myself. Digital pictures were taken and enlarged to get as much detail as possible. If a decision could clearly be made as to the correct information, I did so. If the data was still uncertain, the discrepancy is indicated in the transcription below. This cemetery is also known as Dimick Cemetery. The oldest burial appears to be that of David, son of Lemuel & Sibbill CHAPMAN, who died on May 3, 1804 at the age of 7 years. The following is inscribed on the front gate "This fence presented to Maplewood Cemetery by Winifred L. Sperry, 1965." Row and stone numbers are taken from the work done by Goddard / Tobias. They numbered from south to north (right to left), starting with row one closest to the road and row 21 farthest away. Cross references to newspaper articles are taken from Virginia A. Wolfe's work. Dau. of A. C. & Sarah L. ADAMS Died Dec. 24, 1876 AE 5 Y'rs. 1 Mo. 9 D's. Eunice Wife of Joshua ARNOLD Died Jan. 21, 1881 Aged 66 Yrs. Allen G. AVERY Died in Montana Mar. 7, 1917 AE 40 Yrs. George W. AVERY 1838 - 1910 Co. M. 18 Reg. N.Y. Vol. Cavl. Leon H. Son of W. C. & N. A. AYRES Died July 11, 1897 AE 10 Y'rs. 2 M's. & 19 D's. George R. BARNES Died Feb. 21, 1891 AE 27 Y'rs. Asahel P. Died July 29, 1916 AE 77 Yrs. Charlotte R. Wife of B. BEEBE Died Apr. 3, 1880 AE 78 Yrs. Asahel BEEBE Apr. 26, 1848 AE 85 Yrs. Lottie L. Daughter of A. P. & H. M. BEEBE Died Mar. 12, 1875 AE 2 Y'rs. & 7 Ms.
George O. Son of Wm. & Mary BEEBE Died Oct. 30, 1837 AE 2 Yrs. Norman Bell, Died Apr. 25, 1843 Aged 52 yrs. Jason Bell A Soldier of the American Revolution Placed by Adirondack Chapter, D.A.R. Mary Jane Wife of Geo. D. BELL & daughter of Samuel L. & Lucy (White) FISKE Born July 24, 1829, Died Jan. 4, 1906. Truman BELL died March 20, 1840, aged 59 years. Prepare to meet thy God. Dennis Bell Died Mar. 12, 1848 AE 28 Yrs. Laura D. WHEELER, Wife of Dennis BELL, Died Mar. 2, 1884 AE. 64 Yrs. Sally wife of Ezra BENEDICT Died Oct. 24, l850. Aged 71 years. Mary F. wife of Jehiel BERRY Died Apr. 28, 1869 AE. 74 yrs. (NOTE: For her death notice , see the Malone Palladium, Malone, N.Y dated Thursday, May 1, 1879. Judson A. Son of J. & M. BERRY Died Mar. 19, 1865 AE. 33 Yrs. Behold he sleepeth. Dwight J. BERRY Died Feb. 7, 1876 AE 47 Yrs. Casendana M. Wife of D. J. BERRY Died Feb. 14, 1876, AE. 48 Yrs. Footstones: Jehiel, Casendana M., Mary F.
William M. Son of Philemon & Rhoda BERRY Died Sept. 26, 1816 Aged 2 yrs. & 3 mo. Rachel H. His Wife Died June 5, 1899 Aged 71 Yrs. Samuel BROUGHTON Died June 29, 1851 Aged 77 Yrs. Harriet A. Died Aug. 26, 1849 Aged 2 Yrs. Infant Son Died Mar. 6, l862 Aged 4 Mos 5 Ds. Mother Diadama Wife of Cap. Wm. BROWN Died Nov. 16, 1884 AE 91 Yrs. Took our dear Mother away. J. W. H. BRUNTON Died Mar. 6, 1891 AE 80 Yrs. Edie May Dau. of W. B. & A. M. BUELL Died Nov. 19, 1876 AE 15 Y'rs. Gone to Jesus. Cora Belle Dau. of W. B. & A. M. BUELL Died Nov. 8, 1876 AE 7 Y's. Safe in the fold. Little Jesse Son of W. B. & A. M. BUELL Died July 11, 1868 AE 1 y's 2 mos. & 17 d'ys. Harriet A. daughter of Oliver & Loisa BUEL Died March 23, 1848 AE 2 yrs. & 7 ms.
Hattie L. BUELL Died Dec. 20, 1869 AE 21 ys. & 5 ms.
Henry Son of H. W. & S. A. BUELL AE 10 Mo's. John H. Died Feb. 10, 1872 AE 9 M'os. 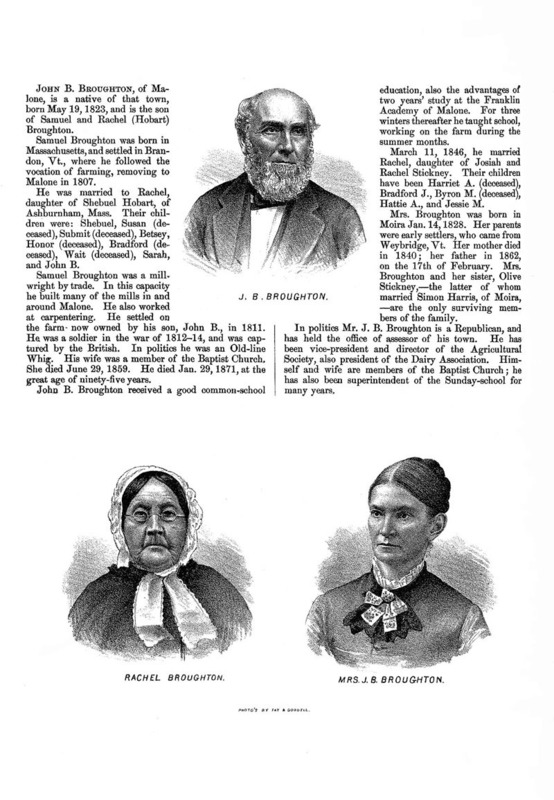 Died at Sheldon, Vt. June 23, 1884 AE 80 Yrs. 3 mos. & 9 dys. David Son of Lemuel & Sibbill CHAPMAN Died May 3, 1804 Aged 7 years. as ye think not the Son of Man cometh. In memory of Betsey Daughter of Jesse & Mary CHIPMAN, who died April 22, 1820 in the 14 year of her age. Lorinda His Wife Died June 6, 1858 AE 45 Yrs. Ebenezer R. DAGGETT Died Oct. 6, 1874 Aged 87 Years. Ursula Died Sept. 29, 1826 Aged 2 mo's. E. R. DAGGET Died Mar. 3, 1895 AE 85 Y'rs. Footstones: Ebenezer R., Rena R., Roxey R., E. Robinson, Judith S., Ursula, Hiram M.
J. F. DIMICK Died Oct. 8, 1871 In his 77 Y'r. Sarah C. Wife of J. F. DIMICK Died July 29, 1876 AE 75 Y'rs. Lafayette W. Son of J. F. & S. C. DIMICK Died Mar. 4, 1826 AE 2 Y's. Levi M. ELDRED Died Jan. 22, 1897 Age 76 Yrs. Rebecca His Wife Died Oct. 2, 1912 Age 85 Yrs. Sally Wife of Thomas W. ELLIS Died Jan. 3, 1839 Aged 51 yr's. Selim ELLIS Died Sept. 2, 1889 Age 85 Y'rs. Elisa BROOKS His Wife Died Sept. 23, 1847 Age 37 Y'rs. Clestea E. Died May 15, 1839 AE 2 Yrs. Louisa Wife of Munson M. ERWIN Died April 17, 1874 In her 61 year. George EVARTS Died Nov. 26, 1856 Aged 65 Y'rs. Abigail EVARTS Died Feb. 1, 1871 Aged 83 Y'rs. Stephen FISK Died Dec. 9, 1850 AE 67 Y'rs. His Wife Caroline Died July 23, 1864 AE 75 Y'rs. She is not dead but sleepeth. Footstones: Mother, Alice N., William W.
Abigail L. GLEASON Died Feb. 7, 1852 AE 30 Yrs. & 1 Mo. Ann R. Daughter of J. & A. GRAHAM Died Apr. 28, 1858 AE 16 Y. & 8 M.
(side) Nellie Their daughter Died April 6, 1876 Age 14 Y'rs. Maria GRAVES Died June 12, 1872 In her 32 year. Emma E. His Wife Died Mar. 1896 AE 64 Y'rs. Effie Daughter Died Sep. 1863 [sic] AE 2 y's. Infant Son Died Mar. 1866 AE 2 M's. Edward A. Son Died Apr. 27, 1934 AE 74 Y'rs. Effie A. Died Sep. 11, 1862 [sic] Aged 2 y'rs. & 6 m's. Also Infant Son Died Mar. 19, 1866 Aged 7 w'ks. Gertrude Mae Dau. of C. L. & H. L. HAPGOOD Died Sep. 12, 1892 AE 8 Mos. Lorin Daughter of H. & P. HARMON Died Jan. 16, 1855 AE 17 y'rs. & 2 mos. Samuel C. HEATH Died May 29, 1836 In his 78 yr. Which I have paid and so must you. Leah Wife of Samuel C. HEATH Died May 25, 1846 in her 83 Yr.
Prudence Relict of Jabez HILL Died Sept. 4, 1860 AE 85 Yrs. Isaac M. HILL Died April 8, 1841 Aged 27 Yrs. Solomon HOWARD died Aug. 21, 1846 In his 67th year. Horace HUBBARD Died Apr. 14, 1874 AE 78 Yrs. Sally Wife of Phineas JONES Died June 23, 1893 AE 78 Y'rs. Royal W. JONES Died Aug. 1, 1902 AE 58 Y'rs. Co. I 121 Reg. N.Y.S. Vol. Alma L. JONES Died Oct. 20, 1913 AE 63 Y'rs. Fayette R. Died Feb. 16, 1872 AE 4 Y'rs. 4 M's. Flora L. Died Sept. 14, 1897 AE 7 Y'rs. 9 M's. Laura A. Died Apr. 1909 AE 15 Mos. 7 Ds. Lawrence Died Oct. 1908 AE 9 Mos. 12 Ds. Where the righteous ones are found. Melicent KETCHAM Died May 3, 1866 AE 85 Y'rs. Phidelia Wife of Harvey W. KETCHAM Died July 16, 1869 AE 65 Yrs. Franklin Died May 29, 1949 Aged 3 Yrs. George B. Died Aug. 4, 1839 Aged 2 1/2 Yrs. John S. KING Died April 22, 1865 AE 60 Yrs. Polly Wife of John S. KING died Dec. 23, 1845 AE 38 y'rs. Annis CHURCH Wife of John S. KING Died Feb. 27, 1883 Aged 75 Yrs. Sally Wife of Willard KING Died Nov. 7, 1883 AE 67 Yrs. promised us, even eternal life. Harry L. KING Died July 25, 1883 AE 69 Y'rs. Azariah G. died ____ Jan. 22, 1864 AE 23 Yrs. Hayden D. died Sep. 1, 1865 AE 23 yrs. Wilbert J. died Oct. 24, 1865 AE 17 yrs. NOTE: The following information was found in local newspapers. Died, at Whitaken Hospital near Williamsburgh, Va., June [? ], 1863, of Typhoid Fever, GEORGE A. KING, of the 142d N.Y.S.V., and son of Harry L. King, of this place. - funeral will be attended at the Methodist Church next [Sabath], at 1 o'clock P.M.
Died. In North Bangor, Sept. 1st, HAYDEN D., son of Harry and Betsey KING, in the 23d year of his age. Died. In Bangor, Oct 20th, of Typhoid fever, LESLIE E. KING, in the thirteenth year of his age. Also of the same disease, Oct 24th, ALBERT M., in his tenth year of his age, and WILBERT J KING, in the seventeenth year of his age, sons of Harry and Betsey King. Leslie L. died Oct. 20, 1865 AE 13 Yrs. Albert M. died Oct. 24, 1865 AE 9 Yrs. Henry H. KING Died July 10, 1879 Aged 38 Y'rs. 5 Mo's. Lewis E. 1832 - 1913 Priv. Co. D 142 N.Y.Vol. Harry W. 1896 AE 1 Mo. 11 D'ys. Jenks LUTHER Died Sept. 25, 1858 AE 72 Y'rs. Charles S. LUTHER Died May 28, 1886 AE 75 Y'rs. 4 M's. Betsey J. His Wife Died Dec. 14, 1884 AE 67 Y'rs. 4 M's. Harry M. Son of C. S. & B. J. LUTHER Died Oct. 14, 1845 AE 4 Yrs. 4 Ms.
William LYNN Died Dec. 17, 1870 AE 69 Y's. 10 m's. & 17 d's. Who called your Willie home. William MASON Born May 19, 1782 at Cheshire, Mass. Lived in Malone from 1803 to 1844 Died Aug. 23, 1846 Buried at Sheldon, Vt.
Mary J. Wife of R. W. PARKS Died June 6, 1889 AE 54 Yrs. Watson W. Son of R. W. & M. J. PARKS Died May 3, 1861 AE 1 yr. & 22 ds. Susan M. daughter of R. A. & M. H. PECK died Apr. 9, 1854 AE 1 year & 3 mos. Noah W. PERKINS Died Mar. 23, 1898 AE 28 Y'rs. Polly Wife of L. C. ROGERS Died Aug. 3, 1872 AE 21 Y'rs. 1 Mo. Hiram D. ROWELL 1822 - 1904 Co. H 142 Reg. N.Y. Vol. F. E. RUSSELL Died Feb. 12, 1874 AE 46 Y'rs. Orpha L. daughter of N. E. & H. RUSSELL Died Oct. 12, 1850 Aged 2 years 2 mo's & 5 days. Ella T. Died Oct. 21, 1855 Aged 6 y'rs. & 5 mo's. Chester RUSSELL Died Oct. 22, 1886 AE 78 Yrs. Carah A. Wife of Chester RUSSELL Died Dec. 18, 1858 AE 48 Yrs. Dexter E. RUSSELL Died Feb. 27, 1885 AE 29 Yrs. Alvin H. RUSSELL Died Oct. 19, 1864 AE 28 Yrs. N. L. SHERWIN Died Apr. 9, 1905 AE 75 Yrs. Arvilla A. His Wife Died July 19, 1901 AE 68 Y'rs. Edna M. Died Apr. 20, 1901 AE 31 Y'rs. Hannah H. Wife of Wm. SHIPMAN Died Oct. 2, 1857 AE 31 y'rs. & 3 mos. Ella Maria Daughter of Wm. & Hannah H. SHIPMAN died Feb. 6, 1854 AE 1 yr. 3 mos. & 14 ds. Freddie A. Son of Wm. & Susan A. SHIPMAN Died Mar. 27, 1860 AE 6 ms. & 11 ds. AE 16 ys. & 3 ms. Yet we do mourn and miss him here. Simon SHUTTS Died April 30, 1880 AE 81 Y'rs. 11 Mo's. (NOTE: For his death notice , see The Palladium, Malone, N.Y. dated Thursday, May 6, 1880. Hellen I. Dau. of S. & P. SHUTTS Died Dec. 20, 1868 AE 37 Y'rs. Meribah Daughter of M. & M. F. SPENCER Died July 14, 1861 AE 23 Y'rs. & 2 m's. William SPENCER Died Dec. 23, 1912 Aged 93 Yrs. Julia His Wife Died July 24, 1893 Aged 71 Yrs. Orinda WAIT His Wife Died Mar. 21, 1898 AE 76 Yrs. Nellie M. Daugh. Of N. W. & H. M. SPENCER Died Aug. 9, 1864 AE 7 mo's. Geo. D. SPENCER Died June 17, 1902 AE 66 Y'rs. Elma Wife of Geo. D. SPENCER Died June 18, 1888 AE 44 Y'rs. Sacred to the memory of Deac. David SPERRY who died Dec. 9, 1845 AE 67 yrs. you while I was yet with you. Dea. David SPERRY died Dec. 9, 1845 AE 67 y'rs. Rebecca Wife of Dea. David SPERRY died April 16, 1862 AE 79 y'rs. Removed from Cornwall Vt. To Malone in 1804.
unto you while I was yet with you. In memory of Elizabeth, wife of David SPERRY who died April 18th 1806 in the 25th year of her age. She has gone we hope to rest. To live forever with the blest. Shall flourish when they sleep in dust. In mem'ry of Mary, wife of Lyman SPERRY, who died June 18, 1819, in the 36th year of her age. In memory of Levi S. Son of Lyman and Mary SPERRY who died June 18, 1819, aged 5 years. Death they were not divided. 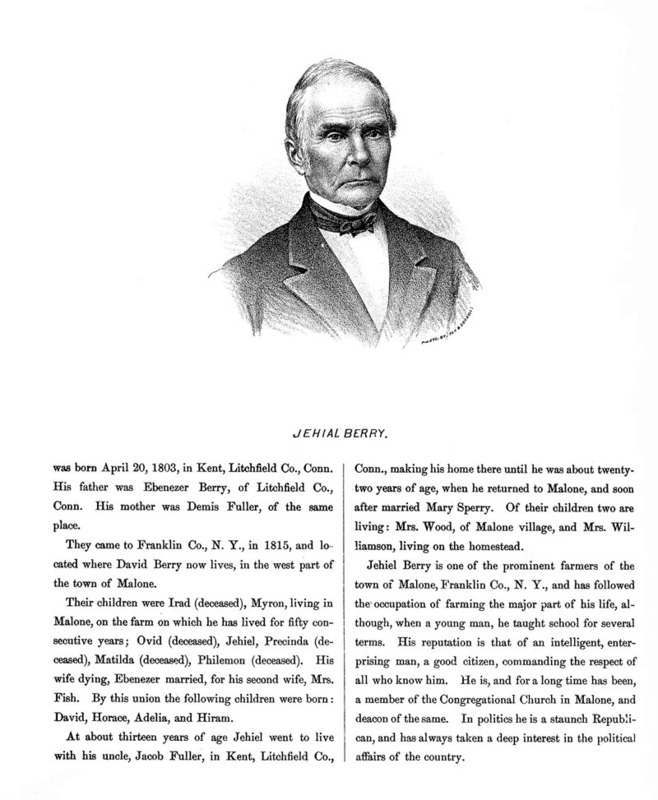 Samuel SPERRY Died Apr. 4, 1849 Age 39 Y'rs. Polly H. His Wife Died Nov. 2, 1904 Age 90 Y'rs. Angeline J. SPERRY Died May 29, 1889 Aged 70 Y'rs. Lyman B. SPERRY 1838 - 1920 From Private to Capt. Co. B 98 Reg. N.Y.V.L. The righteous shall be in everlasting remembrance. Alfred M. STEVENS Died July 26, 1930 AE 81 Yrs. Clarence B. Died Mar. 26, 1888 AE 6 Yrs. 7 Ms.
Myron C. Died Apr. 6, 1888 AE 5 Yrs. 3 Ms.
Haden July 25, 1842 Age 1 month 23 days. 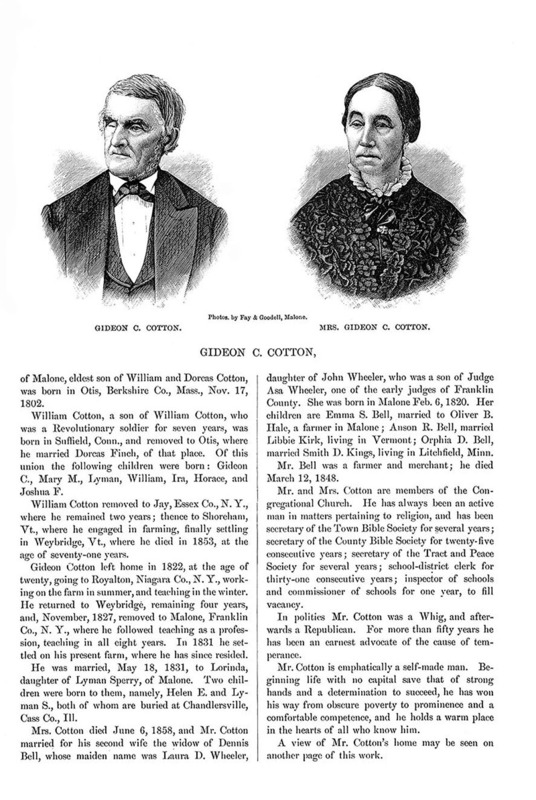 Children of Ezra & Cornelia STOWELL." Mary Emeline Died Sept. 17, 1850 AE 3 y'rs. 5 mos. Mercy Carpenter Died July 24, 1851 AE 11 y'rs. & 8 mos. Jesse Died July 5, 1851 Aged 7 mo'ths. Lucinda Wife of Elisha TAYLOR Died Feb. 16, 1859 AE 70 Yrs. Robert D. TAYLOR Died Oct. 24, 1883 E 64 Yrs. Caroline Died Mar. 21, 1894 AE 77 Yrs. John E. TAYLOR Died Sep. 22, 1886 AE 25 Yrs. Alice E. daughter of R. D. & C. E. TAYLOR Died Dec. 8, 1854 Aged 14 Mo's. Laura D. Wife of John M. TAYLOR Died April 21, 1890 Age 25 yrs. & 5 mos. In hope of eternal life. Hannah E. VANDERHOOF Wife of Nicholas TURNER Died May 4, 1889 AE 45 Y'rs. Nicholas TURNER Died Dec. 14, 1903 AE 69 Y'rs. Mettie I. Dau. of Nicholas & Hannah TURNER Died Feb. 5, 1903 AE 34 Y'rs. Libbie Marie, Dau. of Nicholas & Hannah TURNER died Mar. 23, 1878 AE 4 Y'rs. 6 Mo's. Libbie Marie Dau. of Nicholas & Hannah TURNER Died Mar. 23, 1878 AE 4 Y'rs. & 6 mo's. Florence E. daughter of F. M. & C. A. WAKEFIELD Died March 27, 1859 AE 2 y. & 1 m.
His ashes rest, in yonder urn. I saw his death, I closed his eyes. Wait H. WARNER died Jan. 26, 1857 AE 76 Yrs. & 10 Mos. Elvira M. daughter of Lyman & Olive WARNER died Feb. 16, 1851 AE 17 Yrs. Strive to enter in at the strait [sic] gate. John WHEELER died Jan. 28, 1844 AE 52 Yrs. The hope of the righteous shall be gladness. Truman WHEELER Died Sept. 1, 1816 Aged 54 yrs. Anna H. Wife of Truman WHEELER Died Sept. 23, 1844 Aged 80 yrs. Samuel WHEELER Died Mar. 13, 1831 AE 30 yrs. & 3 mo. Juliana WHEELER Died June 2, 1884 Aged 81 Y'rs. Truman WHEELER Died Dec. 5, 1855 AE 65 Y'rs. Polly Wife of Truman WHEELER Died (blank) 1833 AE 42 Y'rs. Ashbel Son of T. & P. WHEELER Died Sept. 1843 AE 16 Y'rs. Sophronia Dau. of T. & P. WHEELER Died Nov. 1846 AE 14 Y'rs. A. Judson WHEELER Died Mar. 20, 1894 AE 64 Yrs. 3 Mos. Died Dec. 1, 1877 AE 17 Y'rs. & 3 mo's. Lilly H. WILCOX Died Feb. 12, 1894 Age 83 Yrs. Miriam M. Wife of Lilly H. WILCOX Died Dec. 12, 1881 AE 69 Y'rs. Lydia M. Dau. of L. H. & M. WILCOX Died Oct. 12, 1853 AE 6 mos. Josiah M. WILCOX Died Feb. 22, 1885 AE 62 Yrs. A. Alberta WILCOX Wife of Henry BELKNAP Died Oct. 18, 1888 AE 21 Yrs. 4 Mos. Willmoth W. WRIGHT Died Apr. 28, 1883 Age 32 Y'rs.